Best Buy is the home of the latest cameras and camcorders, including the full line of new GoPro cameras, plus a broad assortment of accessories. 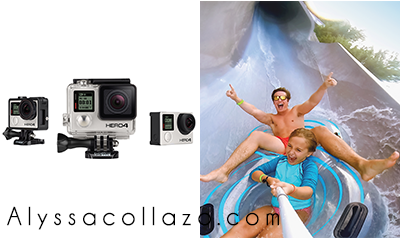 GoPro cameras make the perfect holiday gifts for everyone, from kids and teens, to gadget gurus. GoPro's new line of cameras allow you to beautifully and authentically capture and share the experiences that bring purpose, adventure, and joy to your life. I have to say, Best Buy is correct. They are my first and only stop to getting the latest product information on new electronics and accessories. My family and I love walking around the store to see what's new, especially before the Holidays. As an amateur photographer, my first stop is always the Cameras. Having the right camera equipment is not only important but it allows me to catch those special moments in life. A picture is more than a picture, it can tell a story and it can also leave a memory that will last forever. Just having that ability to share fun times with my loved ones vs capturing it, makes it all worth while. GoPro is a camera that can do just that. You can take action photos and videos like never before. I highly recommend GoPro's new line of Cameras. If you are trying to get the perfect action shot or just like taking good pictures, this is for you. It's a great investment and they are very easy to use. That is a wicked cool camera. Best Buy has all the best gift ideas. Thanks for sharing! I've been slowly looking into a go pro, and haven't yet made the decision on it! This sounds amazing. I haven't heard of this brand before, but I'm definitely going to check it out. Thanks for sharing! I've been wanting to get a new camera. Sometimes my cell phone doesn't cut it for capturing memories. I just got my husband a GoPro! He flippin' loves it! This is the coolest camera. 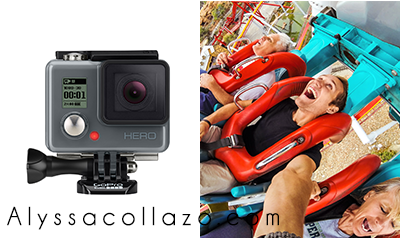 It is a must for adventuresome family. I am going to have to get it for us so we can capture our memories. My husband wants one of these so bad! I think maybe I need to surprise him for Christmas! I have seen a few posts about this and it does looks good. I so cant wait to check these out! my oldest (13) loves to take pics like her momma and this new line looks amazing! I LOVE my GoPro- I use it all the time. Everyone should have one! These part is that they are basically indestructable. I think the go pro is awesome.. i am not so much an adventure seeker.. but i just want one. My in-laws have a go pro and use it on their speed boat to video themselves on the skidoo raft. It really is a robust device! Getting this for my son for Christmas. What a cool camera. This will be an awesome gift for me as I love to travel. I like how the picture's are very clear and capture every moment. I love Best Buy and I really love the looks of these new cameras. Thanks for sharing. my hubby would love a GoPro. Our nephew has one for his dirtbike videos. This is an ideal camera to buy for those who are sporty and adventurous. Definitely it's a good gift to yourself. I'm planning to get a powerful camera that's lightweight and I'm torn between this and the Canon Powershot N. I have the second version of the Tough by Olympus. What an amazing camera! I can't wait to check this out. I'm off to Best Buy! These are amazing cameras. We have one and my son uses it while playing paintball and skateboarding. He also likes to wear it while practicing with his band. 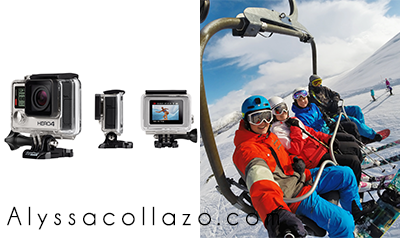 a Go Pro camera would make a great Christmas gift. It would be fun to have one of these! I love shopping at Best Buy for electronic. They have great service and products. This action camera looks amazing and I will have to check it out. Thanks for sharing. I need someone to buy me one of these for Christmas. I told my son this is what I wanted. That is so cool! I would love something like this! My son put this on his Christmas list. Thank you for the post. Speaking of children- your girls are absolutely adorable. I have the last model of Go Pro and am seriously thinking of getting the new one, too! My husband has some wicked ideas for being able to edit footage from his ski helmet cam and my son's so we could have more angles! Love it. Coincidentally, I am looking for a new camera, I think I'll consider this on my list. Thanks for sharing! I need this in my life! I'm been wanting to get a GoPro for some time now. Great review! My husband and I LOVE our GoPro! It's a must have for any adventure!